Healdsburg Breakfast – Can you Smell the Bacon? How spot on is this quote from Caroline Cooney? Why is it so much better to eat breakfast at a restaurant rather than at home? It’s probably the fact that there’s no clean up involved and that the food is probably fresher than what you have sitting in your refrigerators. Our Healdsburg breakfast at the Camellia Inn Bed and Breakfast will be doing the cooking for you. Fresh, Locally Grown, & Delicious is what we live by when it comes to our breakfast. Whenever possible, our breakfast ingredients are locally-sourced, organic and sustainable, in-season and “right off the farm” fresh. 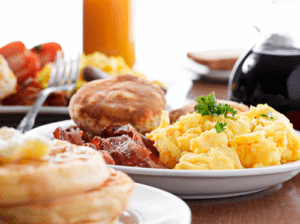 Click this: Camellia Inn Breakfast, to read more about the many options we have for you during breakfast time at our Camellia Inn. Obviously, when you stay with is at our B&B, you’ll have that option for breakfast each morning you wake up. There’s no pressure to eat breakfast with us. We completely understand that you might want to get a taste of the town. There are some wonderful Healdsburg breakfast options for you to choose from. Here are a few of those Healdsburg breakfast spots that we at the Camellia Inn have enjoyed over the years. Let’s just start this Healdsburg Breakfast list off with a blast from the past feeling breakfast joint. Flakey Cream DO-Nuts & Coffee Shop is located at 441 Center St. Only a 5-minute walk from our front door, This Healdsburg breakfast spot isn’t the place you go to for the feel. Flakey Cream DO-Nuts & Coffee Shop is the place you go to spend a reasonable amount of money for some hearty delicious breakfast food. If you’ve read any of our other blog posts that have mentioned breakfast menu’s, then you’ll realize how fond I am of corned beef hash and eggs. Flakey Cream DO-Nuts & Coffee Shop won’t let you down there. They have a fantastic corned beef and hash option. A few other menu options from this great Healdsburg breakfast shop that you should check out are, biscuits and gravy, all American breakfast, and the #11. The #11 is vegetarian and provides you with 3 veggie sausages, eggs and hash browns. Don’t forget to get after a donut or 12! From ray’s originals to the custer-filled. You can’t go wrong. You bet big time! Owners, Vannak and Sokynthea (aka., Nick and Nickie) a married couple from Cambodia came to this country, worked hard, and established a top-notch coffee shop. So, I’m not going to be like Will Ferell on Saturday Night live and yell at you to ‘GET OFF THE SHED’, rather I’m going to yell at you to ‘GET INTO THE SHED!” This Healdsburg breakfast spot is a nice place to enjoy some farm to table style menu items. SHED has a wonderful ambiance to it. It’s a very clean spot to enjoy your breakfast any day of the week. The theme of this Healdsburg breakfast blog seems to be boiling down to a biscuits and gravy review. But seriously, SHED’s biscuits and gravy are to die for. You can also order this exceptional menu option, Anson Mills Stone Ground Polenta with a slow poached egg, garlic Scapes, wild mushrooms, and swiss chard Conserva. Trust us, it’s a must. Located at 25 North St, our B&B is only two minutes from this Healdsburg breakfast masterpiece! The Singletree Café, located on 165 Healdsburg Ave, is a lead pipe lock when you are deciding on a Healdsburg Breakfast option. A three-minute car ride from the Camellia Inn is where the Singletree Café sits waiting for you to come in. The portions are fresh as fresh can be, and filling. The Eggs Benedict as well as the Crab Benedict are brilliant. Another delicious treat is their blueberry pancakes. Trust us, be ready for blueberries! The Singletree Café is an old-fashioned Healdsburg breakfast staple, just like we are at the Camellia Inn. Our Camellia Inn B&B is all about serving you breakfast. Contact us in order to book your rooms and ask us about our breakfast service. We love doing it, and so do these Healdsburg breakfast spots we listed in this blog post. This is just a few of the many breakfast places that are at your disposal when you stay with us or anywhere in Healdsburg. We suggest you take advantage of our daily locally sourced and delicious breakfast first. Then, head out and get a taste of the town. Well, it’s 2 and a half weeks until Christmas! Are you all ready? We here at the Camellia Inn Healdsburg b&b, are ready for you. If you’re planning a trip to the North Bay for the Holidays, and Healdsburg is on your radar, we hope you’ll consider a stay at our Bed and Breakfast. Bring the family, we have plenty of options at our Healdsburg b&b. For example, we have our “Family Suite” with two rooms sharing a bath which can be perfect for up to four. We have so many more options, just head on over to our website to take a peak at everything our Healdsburg b&b has to offer. Whether you stay with us or at another Healdsburg b&b during the Holidays, there will be a bevy of entertaining options going on in Healdsburg and our surrounding Sonoma County areas. I thought I’d introduce you to a bunch of Holiday events going on, in hopes that it’ll encourage you to plan a Holiday trip and stay at the Camellia Inn. On Saturday December 9, from 6 pm until 8pm, The Petaluma River Turning Basin will be having an exceptional boat lighting parade. Check into our Healdsburg b&b, and head down to Petaluma. It’s only a 30-minute drive from our Camellia Inn Healdsburg b&b to the town of Petaluma. We suggest you make a day out of it. There will be free tastings of Pie from the Petaluma Pie Company and the Petaluma Holiday Arts and Crafts Sale will be taking place from 10 am until 4 pm. 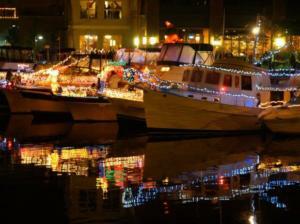 Then you can kick back and enjoy the Holiday lit and decorated boats float on by. It’s a really great time, and best of all it’s free. I think we all can agree, anything having to do with Wining and Dining is going to get people’s attention. How about a Wine Walking tour? These tours are especially popular during the spring and summer months. But, during the Holidays, they are extremely special. A 4-hour day tour is offered every day, but we highly recommend an evening tour which is only offered from Thursday through Sunday. Our town of Healdsburg is all lit up in its Holiday glory, so you’ll witness the magic of the season while enjoying the tastes of the town from three of our top restaurants. Enjoy the Christmas tree lit plaza, colorful street decorations, festive window displays and carolers. What’s also unique, your evening tour can be catered around any of the Holiday events that may be happening at that time. Also, our Camellia Inn Headsburg b&b is in the heart of the city, so it can be your home base as you begin your Holiday Wine Walking Tour. You can get all the information you need here at www.winecountrywalkingtours.com. You can also contact us at our Camellia Healdsburg b&b and we’ll help you get all set up. The Dickens Dinners are a highlight of the year at Madrona Manor, when carolers wander the dining rooms, dressed in period clothing of Olde 19th Century England, and The Twelfth Night Singers pause for private a-cappella serenades of “Jingle Bells” and breathtaking hymns. Even more delicious, is the Michelin-star executive chef Jesse Mallgren’s five-course celebration of new and old holiday traditions, paired with wines. Prices range from $110 – $210 depending on the night. Reservations for Christmas Eve and Christmas day require a non-refundable deposit of $50 per person. The dinner dates are December 8 through December 25th. Stay at our Healdsburg b&b and you’re a five-minute walk from the Madrona Manner. A Michelin Chef and the Camellia Inn Healdsburg b&b, no-brainer! If you are planning a New Year’s stay at our Healdsburg b&b with your children then on December 31st, the Charles M. Shultz Museum in Santa Rosa has the family event for you. Starting at 10 am you can start to ring in the New Year with Snoopy, hands-on crafts for kids, and Santa Rosa’s only Up-Down and Baby Balloon Drops at noon. There will be root beer toasts at noon and 3:00 p.m.! I know there is something on this list of Holiday Events that’ll entice a trip and stay at our Camellia Inn Healdsburg b&b. This is also just a short list! There are so many other special Holiday events happening all around us and ones that keep popping up. It’s a great time to book a trip!